Time to celebrate fall with a pumpkin patch visit and pumpkin roundup! Fall is our family’s favorite time of year, and one of our favorite ways to celebrate is with a pumpkin patch visit. 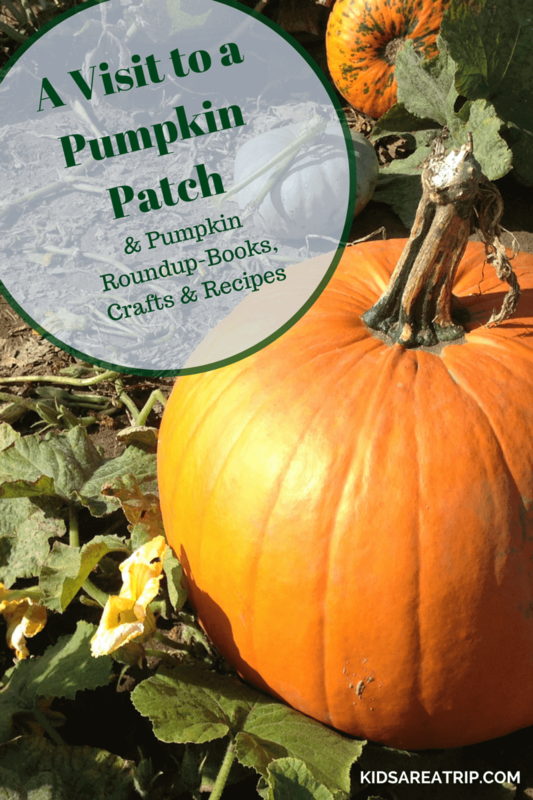 I love all things pumpkin, so I reached out to a few other bloggers and asked them to share some of their favorite books, crafts, and recipes to go along with this post, so let’s just call this a complete pumpkin roundup. Everything related to pumpkins you will find here. 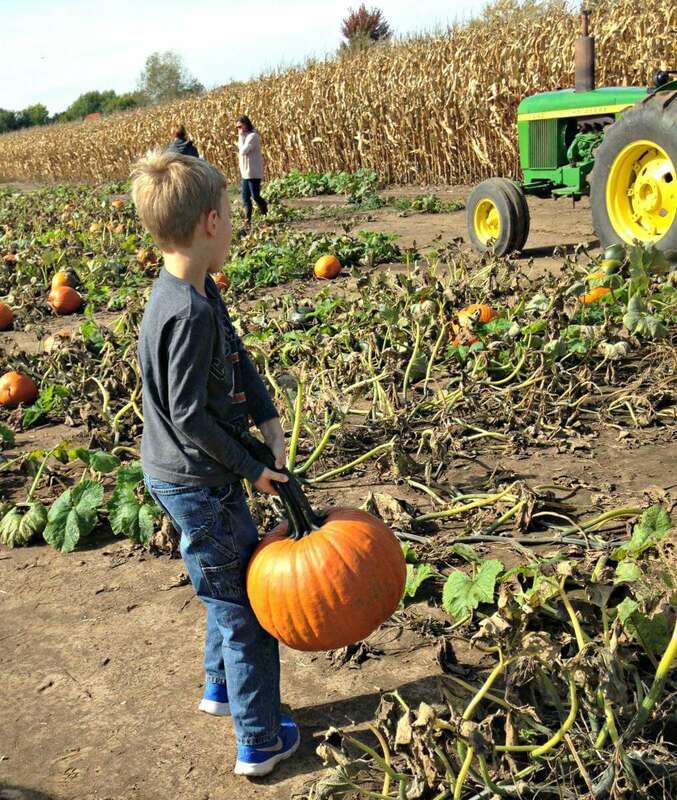 It has been quite awhile since we visited a pick your own pumpkin patch and I didn’t know what to expect when we recently visited Stade’s Farm and Market in McHenry, Illinois. 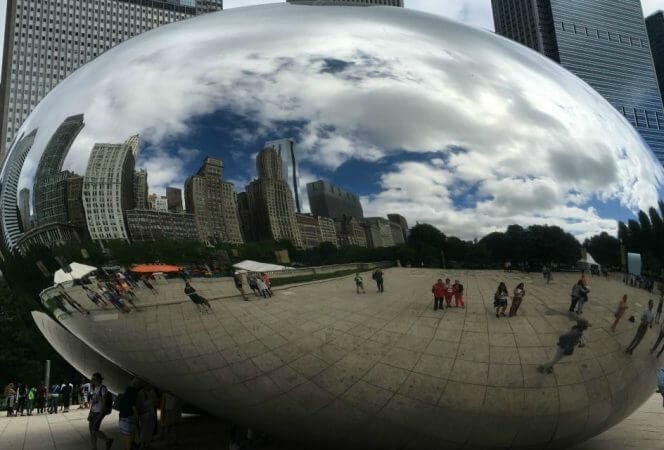 The farm is located about 50 miles northwest of Chicago, but don’t let that dissuade you from visiting, it is definitely worth the drive. 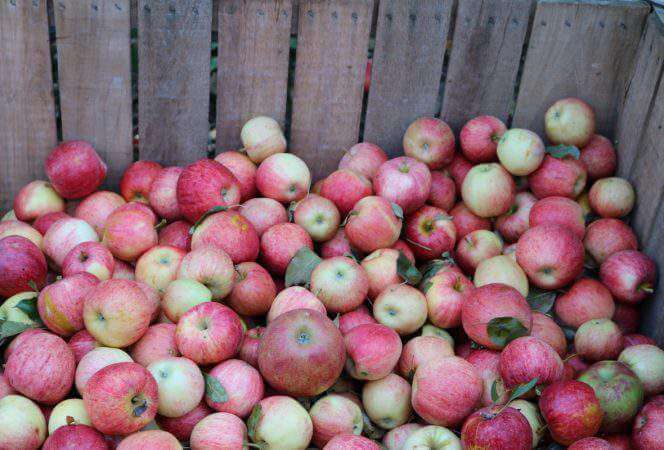 The farm produces over 2,200 acres of crops, from pumpkins to soybeans, and many seasonal fruits and vegetables. During the fall they have a Shades of Autumn festival featuring attractions and entertainment for the family. 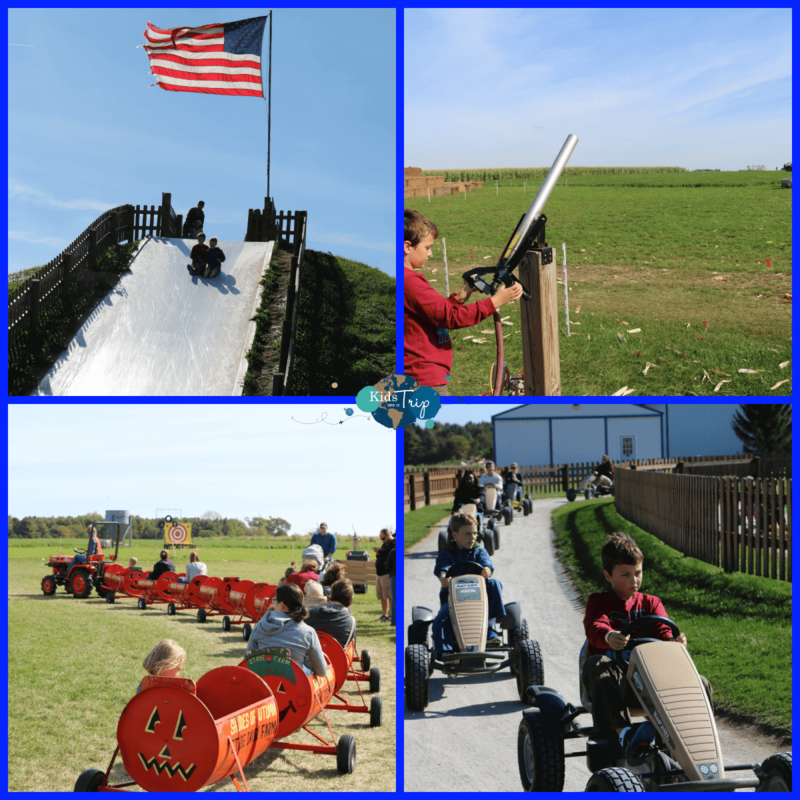 Not only can families take a tractor ride out to the fields to pick their pumpkins, they can partake in various games, rides, and activities. There is a full day of fun for everyone! We went early in the morning (I would recommend) and I must say my kids were super excited when we pulled in the drive. They could see the giant slides, tractor equipment, food booths, and pumpkins everywhere. Once we had our wristbands for the day, they were off and it was hard to keep up with them. There was a pretty large petting zoo, giant slides, a beautifully restored carousel, a ferris wheel for the younger ones, a corn kernel play area (my kids love this), tire swings, zip lines, a corn cannon, jumping pillows, and pumpkin launching (yes, this is a thing). Have I convinced you yet? Let’s just say, my kids were never bored. We stayed three hours in the amusement area and they wanted more. I practically begged them to head to the pumpkin patch, and they reluctantly agreed it was time to head out. We boarded the tractor and went out to the fields. The fields were densely populated with pumpkins. They went as far as the eye could see, and they weren’t just of the orange variety. There were gray, white, green, and speckled ones. Basically, if they can grow it, you will find it somewhere in that field. The boys of course wanted the LARGEST pumpkins. The ones they can’t lift. Since it was just me that day, I could carry them to the tractor, but it was difficult getting them up the stairs. Thankfully, the nice gentleman driving the tractor helped me out. Four different times. Kids. No mom, it’s not heavy! After unloading the pumpkins off the tractor and into a wheelbarrow, we loaded them into the car. We headed into the market to enjoy some apple cider and apple cider donuts. Maybe it was because we were famished, or maybe they were just that good, but the donuts were the softest pillows of sugary dough we have ever found in our search for apple cider donuts. Stade’s Farm and Market hit it out of the park with these beauties, and it was the perfect ending to our successful day at our new favorite pumpkin patch. So what do to do with all those pumpkins collected at the pumpkin patch? You carve them of course! I scoured the internet for ideas and found Girl Gone Mom‘s 19 Real Pumpkin Carving & Craft Ideas. The things people can create with these giant gourds are amazing. If you want to make something with your pumpkins, Coffee with Us 3 has 20 Non-Dessert Pumpkin Recipes. Want some sweet recipes? Check out these from The Jenny Evolution: Make Your Own Pumpkin Spice Latte and Cheesecake Factory Pumpkin Cheesecake Copycat Recipe (Ok, so maybe you won’t use your pumpkin to make these, but the recipes look fantastic)! And to tie it all up with some kid friendly activities, The Jenny Evolution also shared some Picture Books About Pumpkins. Is there a pumpkin patch near you? What’s your favorite thing to do with pumpkins? Looking for other fall posts? 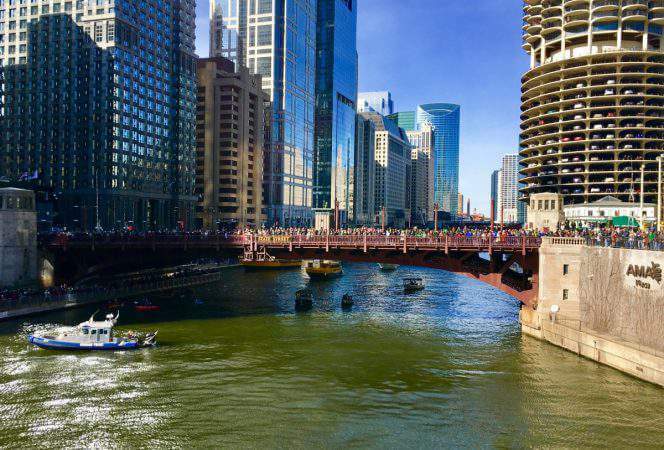 Check out: 50 Allergy Friendly Halloween Treats and FARE’s Teal Pumpkin Project, Fun Fall Activities Across the US, Canada, and UK, and Kid Friendly Spooky Destinations in Illinois.